Telltale Publishing announced that the hit survival horde crafting game 7 Days to Die will release on PlayStation 4 and Xbox One for the first time on June 28th as both a digital and retail product in North America, and digitally in Europe; and will be available on July 1st for the first time at retail in Europe. The recommended retail price is $29.99 USD or equivalent, and the game is currently available for pre-order at GameStop, Best Buy, GAME, and Amazon. 7 Days to Die is published in collaboration with the Dallas-based independent developer, The Fun Pimps. 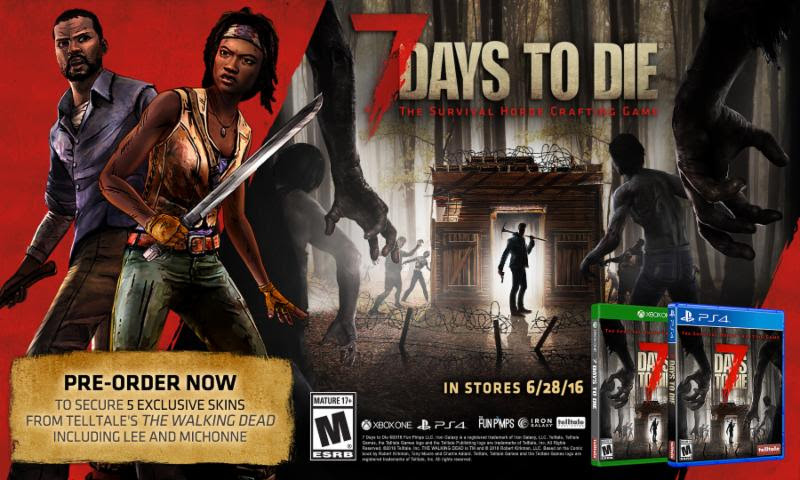 Fans of Telltale's The Walking Dead series in partnership with Skybound will be excited to learn that pre-ordering 7 Days to Die will give them exclusive access to 5 character skins from Telltale's hit series, including Michonne and Lee Everett. 7 Days to Die is rated is rated 'M' (Mature) for Blood and Gore, Strong Language, and Violence by the ESRB. The game is published by Telltale Publishing in partnership with The Fun Pimps. 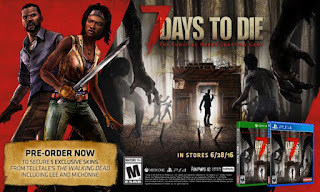 7 Days to Die is currently available for Windows, Mac OS X, and SteamOS and Linux in Early Access on the Steam platform. For more information on The Fun Pimps, visit the official website, follow @7DaystoDie on Twitter, and like 7 Days to Die on Facebook . For more information on Telltale Publishing, visit the official website, Facebook, and follow @TelltalePublish on Twitter.